In the video, Freelee consumes over 700 grams of sugar to advocate her insane diet program. She often posts provocative videos, but her most recent vid truly astounded us. 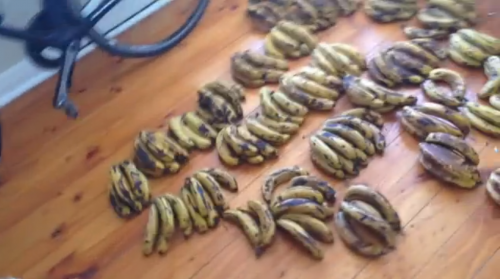 Freelee films herself eating fifty-one bananas in one day, just to show her followers that her diet works. She processes most of the bananas into smoothies, for easier digestion. Still, at the end of each smoothie Freelee shows her stomach in profile. It is enormous. She claims that most of it is simply caused by water, and that her stomach shrinks back down fairly quickly. We sat through the misery of Freelee’s dialogue just to see if she would finish the bananas. That she does, with all the enthusiasm of someone who just ingested over 714 grams of sugar. That number accounts for sugar from the bananas alone, without adding in that of the dates Freelee puts in her smoothies. We’d put her right up there with crazy fruit Instagrammer Loni Jane. Ludicrous nutritional advice aside, YouTube commenters brought up some pretty important issues. Many label Freelee’s massive fruit consumption as gluttony. Others wondered about the possibility of impending diabetes. Watch the video to see Freelee down fifty-one bananas. Turn down for what?